THE TECHNOLOGY HEADLINES features an article examining OrboGraph’s utilization of AI technologies and the effect it’s had the check and healthcare lines of the business. 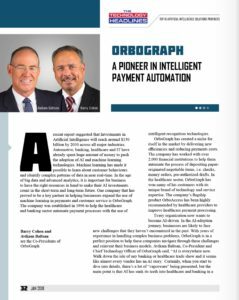 With OrboGraph’s main focus on automating payments, the company looks at AI as a means to improve efficiencies into the entire payment mix and to facilitate electronification of payments, which ultimately reduces the payment costs. This cost reduction will enable banks and healthcare providers to have a lower cost structure, which in turn will translate into lower service fees for their products and services, thus helping them be more competitive in the market. New AI deployment scenarios – for both the OrboAnywhere and OrboAccess platforms – will be highlighted at the upcoming Healthcare and Check Payment Technology Conference in Nashville on May 7-9. Not every “new tech” is worth pursuing, of course, but AI has proven itself to be the wave of the future that successful organizations must start embracing now to remain competitive.